Interstate 505 in California connects Interstate 80 in Vacaville with Interstate 5 near Dunnigan. 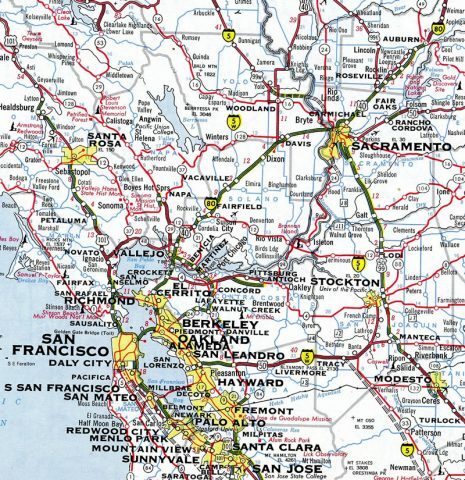 The generally rural freeway provides part of a long distance route linking the San Francisco Bay area with the Pacific Northwest. North from industrial park areas of Vacaville, I-505 stays east of the English Hills through a mix of ranch and agricultural areas to the outskirts of Winters, a city of around 7,000. Beyond there, the route bee lines north to California 16 near the community of Madison, where sunflowers grace the area landscape, providing a truly magnificent site during the peak flowering period. Crossing Cache Creek, Interstate 505 makes a gradual shift to the east, traversing farm land east of Hungry Hollow into the Dunnigan Hills. Emerging from the hills at Oat Creek, the final segment ties into I-5 amid agricultural land in northern Yolo County. The proposed route of Interstate 5W in 1963. Like the eastern end of Interstate 580, the northern end of I-505 is located in a sparsely populated area in the Central Valley. Traffic counts along the route are some of the lowest of any California Interstate, with just 10,700 vehicles per day (vpd) recorded by Caltrans at the north end in 2015. 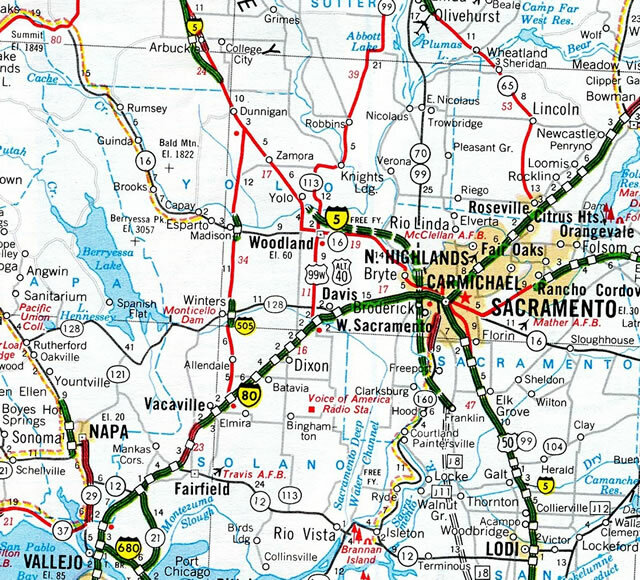 Completion of the SR 113 freeway between I-80 at Davis and I-5 at Woodland in 1990 may have deferred some of the I-505 traffic headed to communities northeast of Vacaville along Interstate 80. The rest of the proposed toll road remained in question, having been suspended due to political considerations. The project web site still shows a $600 million, 40 mile or more four-lane toll road winding northeast from I-680 near Sunol to SR 4 near Antioch. Interstate 505 leaves the Dunnigan Hills and merges with I-5 north across an open agricultural area east of Bird Creek. A lone shield assembly acknowledges the forthcoming junction. Photo taken 05/31/05. A sweeping on-ramp joins Interstate 5 north, forming an auxiliary lane to the diamond interchange (Exit 554) with Road 8. Photo taken 05/31/05. Road 8 spans Interstate 5, one mile north of the wye interchange (Exit 553) with Interstate 505 south. Button copy signs for the freeway leading south to Winters and Vacaville were replaced by 2012. Photo taken 05/29/06. Interstate 505 branches nearly south from I-5 ahead of the Dunnigan Hills. 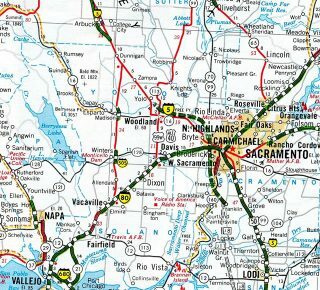 Interstate 5 remains along a southeasterly course to Zamora, Dufour and Yolo. Photo taken 05/29/06. With an adjacent array of big box retail and the Vacaville Premium Outlets adjacent to the freeway, the commercialized stretch of I-80 advances east from the Allison Drive on-ramp to Exit 56 with Interstate 505 north. Photo taken 07/18/09. An auxiliary lane extends east from Allison Drive to the modified trumpet interchange (Exit 56) with Interstate 505 north to Winters. Photo taken 07/24/16. A two-lane off-ramp (Exit 56) for Interstate 505 north departs from I-80 east at the Nut Tree Road overpass. I-505 branches northward by Nut Tree Airport (VCB) and several distributor centers and warehouses to Exit 3 at Midway Road. Photo taken 03/10/15. Interstate 80 east spans Mason Street / Elmira Road ahead of Ulatis Creek and Exit 55 to Nut Tree Parkway. 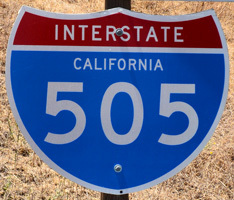 Replaced by 2016, this interchange sequence sign was the first reference of Interstate 505. Photo taken 07/18/09. Interstate 80 used to overtake Monte Vista Avenue at a parclo interchange one half mile west of I-505. Monte Vista Avenue is the historic alignment of U.S. 40, and per USGS topos it was already replaced by a four-lane bypass for U.S. 40 by 1953. This bypass is now I-80, and the former ramps pictured here were replaced with a new interchange for Allison Drive. Photo taken by Michael Summa (1976). Button copy signs preceding the separation of I-505 north from I-80 east here were replaced by 2016. Photo taken 07/18/09. 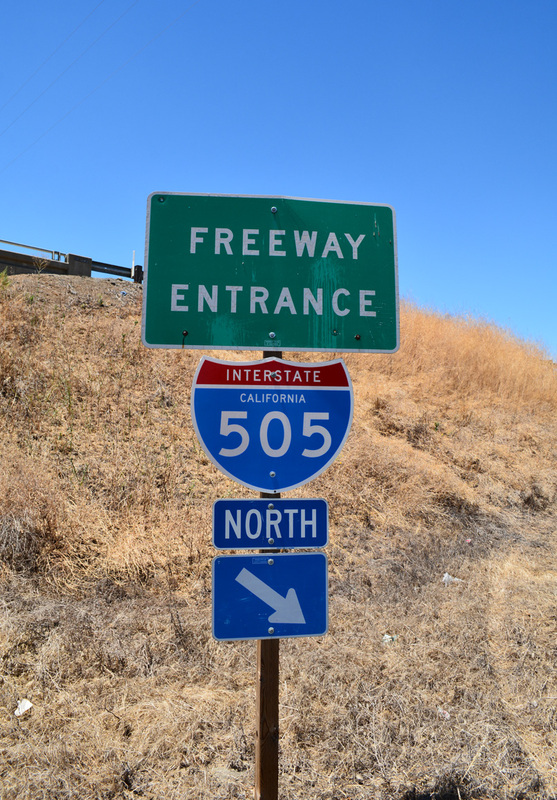 The first exit number sign for Interstate 505 on I-80 east replaced this assembly by 2007. The exchange joining the two freeways is the same configuration as the junction of Interstates 86 and 390 in the Southern Tier of New York, with a u-turn ramp joining I-505 south with I-80 east. Photo taken 03/31/05. Interstate 80 angles southwest through Vacaville to meet Interstate 505 one mile west of Leisure Town Road. Vaca Valley Road replaced a portion of Leisure Town Road, with it constructed as a new arterial leading west to I-505 at Exit 1. Photo taken 07/02/13. Orange Drive parallels the south side of I-80 as a commercial frontage road to the exchange (Exit 56) with Interstate 505. Areas to the north await future development as part of the 172 acre Vaca Valley Business Park.3 Photo taken 07/02/13. Signs for I-505 on I-80 west only reference Reference for the continuation of Interstate 5 north beyond the freeway end. Winters otherwise lies 11 miles to the north. Photo taken 07/02/13. The final button copy sign for I-505 on Interstate 80 west was replaced by 2016. Interstate 505 initially travels north between Nut Tree Airport (VCB) and Vaca Valley Business Park to Vaca Valley Parkway. Photo taken 07/02/13. Former ground level sign posted one mile ahead of the modified trumpet interchange with Interstate 505 north on I-80 west. The parclo B4 interchange (Exit 57) with Leisure Town Road was both modernized and expanded with two additional ramps. A new on-ramp joins I-80 west in this scene now. Photo taken 08/23/03. One quarter mile ahead of Exit 56 for I-505 north on Interstate 80 west. This sign was carbon copied. Photo taken 08/23/03. 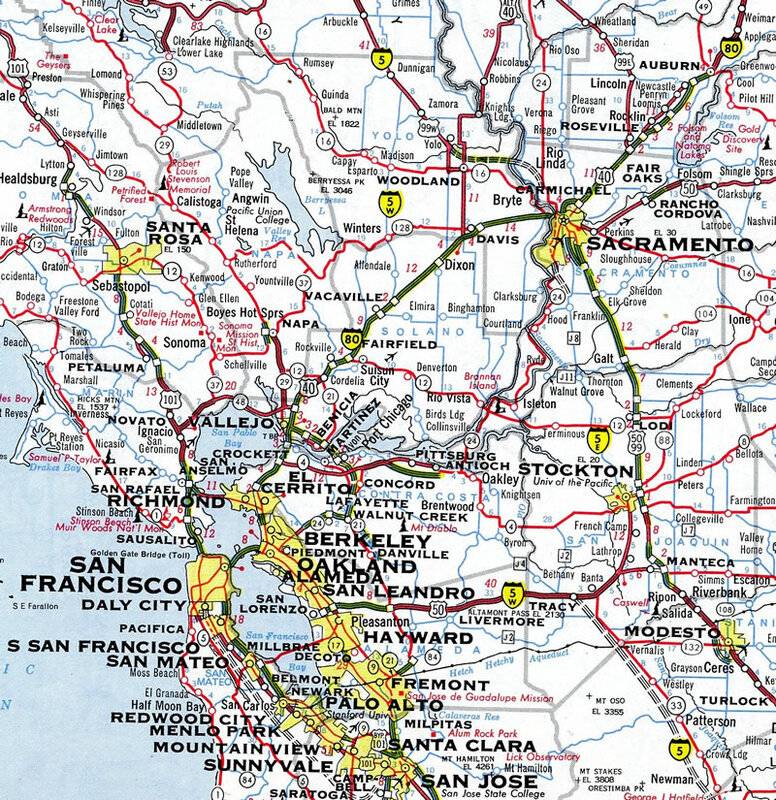 California Highways (www.cahighways.org): Routes 466 through 740. Mid-State Tollway. California Department of Transportation (Caltrans), project web site.